Notes on the Next Bust: Why was r greater than g? Will it continue? And how to reverse it. Why was r greater than g? Will it continue? And how to reverse it. In a previous post, I seek to explain this rising inequality as an inequality between savers and workers; the rising share of GDP going to capital instead of labour. And that the reason for this is predominantly the rise in endogenous money - more commonly referred to as debt. The servicing costs of this debt (and the corresponding high house rental prices) are too high as a proportion of GDP hence more return to savers and less to workers. I wish to discuss this further here. What particularly strikes me is the unsatisfactory nature of r>g as an explanation for inequality for two reasons. First, there needs to be a mechanism that explains how r is greater than g. Saying that it is a natural process that returns the income distribution to 'normal' is not good enough as an explanation for me. Why is there this 'normal pattern'? Second, there needs to be an understanding of whether this will continue. Piketty appears to suggest that this will keep going unless higher taxes are enforced upon the rich. I believe that this ignores the true cause of the inequality of capital. Why was r > g? To answer the first question, we need to examine what it means for r to be greater than g. I will look here only at financial assets, rather than real assets. This means all cash, stocks, bonds, property and assets with financial value but that do not produce anything real. If in year t we have GDP of Pt and total wealth in financial assets of Wt, then in year t+1 we will have total GDP of Pt+1 = (1+gt)*Pt and total wealth of Wt+1 = (1+rt)*Wt. If r>g then it means that Wt+1/Wt > Pt+1/Pt. In other words, wealth grows faster than GDP. This is actually not a natural state of affairs - it is an anomaly that needs to be explained. Wealth can be described as a claim on future work. If I have money, it is given value because I can use it to pay for goods and services in the future provided by work done by future workers. Every unit of wealth receives some return, call it a dividend, d, per year. The total value of d*W must be some proportion (χ, where 0 < χ < 1) of GDP. 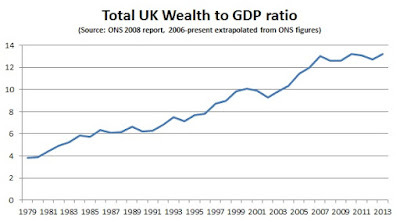 So, in a given year, d*W = χ*P.
Therefore, if wealth goes up relative to GDP then one of two things must be true. Either expected future d has gone down or expected future χ has gone up. Either the expected future return goes down or the expected return to savers increases versus the return to workers. This means that r > g is not an explanation in itself. A consistent r > g means that either that expected future dividends have gone down or that the capital share of GDP has increased relative to the worker share. Or indeed both. 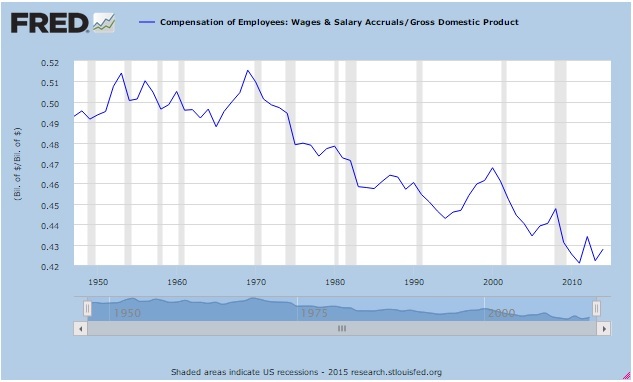 This shows how since 1970 the share of GDP going to those actually doing the work has reduced. On top of this, as I discuss in the post, property rentals as a proportion of income have risen so workers have even less disposable income than this shows. Therefore the share of GDP going to capital has greatly increased. I argue that the reduced worker share is due to a combination of both recently improved rent seeking on the part of corporations as well as the cost of servicing all of the corporate debt that has built up since the 1970s often not used for productive purposes. It charts the total value of financial assets (bonds, shares and cash) in the UK, not including housing. It shows how total wealth has risen from approximately 4 times GDP in 1979 to closer to 13 times GDP in 2014. This, on its own, is enough to explain DeLong's question as to why one needs 3.5 times as much wealth now to be in the top 0.01% as one did in the late 1960s. The majority of the economy consists of workers, whose increases in pay are proportional to GDP. If the richest people today have the same proportion of wealth as the rich in 1979 then they will have over three times as much wealth relative to the workers. How has wealth gone up so much? Almost all of the increase in wealth is in the form of endogenous money - either cash created by private banks (about 97% of all cash is created by private banks) or bonds created by companies and the government. Without this there is almost no increase in gross wealth to GDP (maybe the 30-40% assumed by the increase in capital share above). But every time a bank creates a mortgage for someone to buy a house, the seller receives money and so there is an increase in savings. Every time the government issues debt to fund spending, there now exists all previous savings plus some more government bonds so there is an increase in savings. Every time a company issues debt, they increase the amount of money-like assets in the system. So here we have the reasons why r has been greater than g. It is partly because of the increased share of GDP going to capital. But it is mainly because of the increase in wealth caused by the explosion of private sector and (to a lesser extent) government debt. Incidentally this is why interest rates can not rise much from here; the wealth is higher so the d must be lower. For r to continue to be greater than g, we need the wealth to GDP ratio to keep rising. As discussed, if there is no fall in GDP, then this can happen for two different reasons. The first is the increase in endogenous money. We can not rule this out, but since 2008 it has been harder and harder to encourage more private sector debt to be taken out. Even with interest rates at zero, growth prospects are deemed so poor and property prices so high, that private sector debt has, in the West, actually reduced. 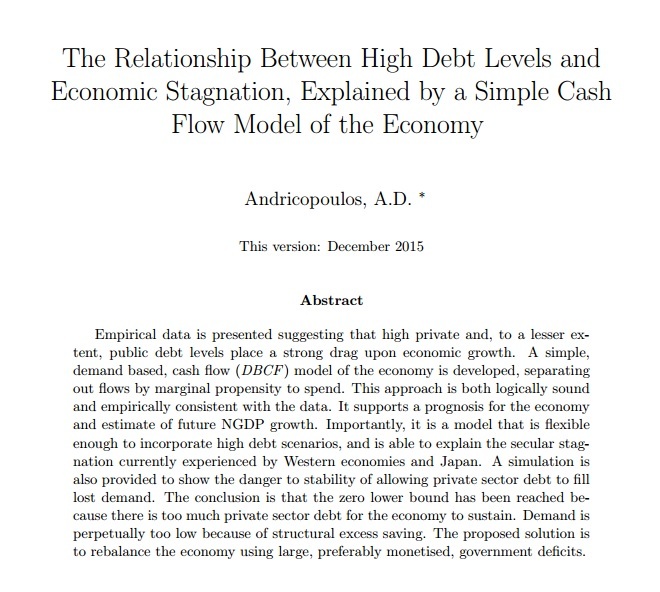 Although it is not impossible to increase private sector debt, and the UK government is trying its best, the higher the level, the higher it becomes to force it higher. The other way would be for capital to continue to extract more from labour. This can be done either with better technology where robots replace humans, or through reduction of wages in the economy (as has happened in the UK) due to increase of labour supply. 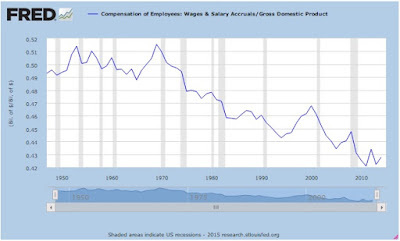 However, this is also self-defeating as the reduction in wages then leads to a reduction in demand for goods produced. The equilibrium level where demand = supply will be at a lower level of GDP than we currently have. The sensible move then would be more redistribution from robot owners to other citizens, as I discuss here. For these reasons inequality may well be close to a peak. The easy rise in inequality, caused by explosion of debt, has ended. Wealth to GDP is no longer rising. Inequality may well rise again but it will be due to a fall in the denominator. It would be accompanied by a horribly shrinking economy, not by economic growth as before; due to a reduction in the equilibrium in a way similar to that I discuss here. The problem, as I discuss in many places (eg. here) is that we have a structural lack of demand in the economy caused by debt leading to over-saving. This may well lead to the crash that causes inequality on an even larger scale. Here, most people look at higher taxes as the answer. Whilst I agree that higher taxes are good (up to a limit) for reducing inequality and increasing growth, the problem is that capital is very mobile and pinning down taxable profits is very difficult. Also, taxes can alter incentives in the wrong way as it is more common to tax work than capital. In fact, although phasing out the tax relief given to interest payments would be a good start, higher taxes are not necessary to redistribute wealth. In order to reduce inequality we need to increase the share of income going to poor rather than rich. One way of doing this is for the central bank to print money and give it to the government for government spending. As government spending disproportionately goes to the poorer in society this will increase income at the bottom end. The increase in demand caused by this money will help return the economy towards the trend growth line that it was on until 2008 when the flow of money (previously supplied by private sector debt) in the economy was cut off. This will therefore increase GDP meaning each member of the economy gets more in absolute terms. Those worried that this will cause inflation need not be, if the rise in central bank money is undertaken responsibly (as discussed here). They were not worried about inflation when private sector debt increased the money supply on a scale far greater than this. It is a fallacy to think that government money is so much more inflationary when we have low demand in the economy. It will first create growth with only small inflation, then, only when supply can not take the increase in demand, higher inflation. This procedure will also eventually lead to a reduction in the wealth to GDP ratio by removal of private debt from the economy. It would work as follows. As central bank money in the economy increases, and moderate inflation returns, the central bank can raise interest rates thus reducing the amount of private sector debt. This means that the real cost of servicing the debt will reduce therefore allowing more of GDP to go to the workers. The multiplier of government expenditure on GDP is much higher than private sector debt; a 1% increase in central bank money could probably take 5% of debt money out of the system. Similarly house prices relative to GDP should decline as interest rates go up, debt is reduced, and GDP rises. Since much of the rise in house prices was caused by increase in debt used to buy them; it follows that a reduction in private sector debt should lead to a relative reduction in house prices. More affordable house prices should mean working people more able to buy their houses and therefore lower rentals. Higher rentals, caused by those unable to afford the down-payment on their own house, redistribute money to the rich from young workers. A reduction of house prices, again, reduces the amount of income relative to GDP flowing to the owners of capital. In general, to reduce the inequality, one must look at ways to reduce wealth to GDP by both reducing gross assets and increasing GDP. For example, a change in patent law to reduce rent seeking from patents would probably help to reduce profit margins of corporate incumbents. The minimum wage probably still has a fair way to go up while still improving economic growth. This is because almost all money going to those on the minimum wage will be spent in the economy, increasing demand. It also shifts more of the share of GDP from capital to labour. The minimum wage should be set to gradually rise in real terms every year until the point that it causes detriment to economic growth. Other methods to redistribute in the UK would include building more houses to reduce rental costs. Another would be removal of the tax exemption of debt on buy-to let houses, which would encourage repayment of debt and also reduce house prices relative to GDP (although the economy would suffer without a replacement of the demand with government money). Removal of the corporate tax exemption of debt would be very good but practically would result in corporations switching jurisdiction. But by far the most growth increasing and inequality reducing measure a government can do is to allow the central bank to print and give it money in a controlled, inflation targeting manner. It increases income to the poorer, reduces asset prices and increases GDP in a low demand economy. As I discuss here, it is not only desirable but necessary as the economy is in a very unstable state. Without it, I fear at best long-term stagnation and at worst economic misery. "Every time a company issues debt to buy back shares, there is an increase in gross wealth without an increase in productivity." That's an asset swap. No change in wealth at all. Less shares, more debt. It's option schemes that vest in new shares that generates the wealth expansion for no increase in productivity. "That's an asset swap. No change in wealth at all. Less shares, more debt." Good point. I will change it. "It's option schemes that vest in new shares that generates the wealth expansion for no increase in productivity." This would be wealth at the expense of existing shareholders, wouldn't it? I was wondering what the buyback does to the price of the share? Does it increase the value of existing holdings? The buyback borrowing is worth the capital gain etc. Just a curious thought about the way these markets work. In theory, the share price should be the same before and after a buyback as no value has been added. In practice, I would extremely surprised if the extra demand for shares does not cause an average rise the share price. As such they are tempting propositions for executives with shares or options vesting soon. Are you saying this time isn't different? Here is a logarithmic plot. GDP is the dashed line. I have make lines fatter for emphasis and included dividends for the corporate non-finance equities. Light blue line, net equities of financial companies, breaks in places where it is negative. I thought it was interesting to compare to house holds' equities held and that of the non-financial corporate equities. So the slope is the exponential growth rate on a log graph. Why is g practically equal to r? g for gdp growth and r for wealth growth. Unless I have read the graph wrong, r is clearly steeper than g on the log graph. Your non-log graph below is a bit difficult to work out! ** Geometric average for the math inclined. *** I think this series is current cost, not historical cost. Current cost is often greater than historical cost (accounting term). **** e = continuously compounded doubling or continuously compounded of annual rate of 100%. The current growth rate (and shrinkage rate) of the "value" of total corporate stocks varies more than that of GDP. Stock "value" growth rates for shorter periods of time are higher and lower than GDP growth rates. GDP growth is more stable. GDP growth is usually positive while stocks growth are negative more often. Do you think there is a roughly dynamic mean reversion of wealth to GDP except for the difference in growth rates? It's all dependent upon the creation of new money through debt. The more debt the is, the more wealth there is. Then there are the market fluctuations around this trend. Hopefully we can reduce the debt levels (and, with that, the wealth levels) by higher government deficits but probably we will continue to damage the economy with more private debt until we crash again. "The nation’s preeminent investor, Berkshire Hathaway's Warren Buffett, has often said that probably the best single measure of where valuations stand at any given moment is the ratio of the total market capitalization to the total dollar value of the GDP. And any time that valuation stands at more than 100% of the total goods and services in the economy means it is time to be wary about common stocks. It’s a logical conclusion that the economic output of a country and the earnings of its companies, and so their valuation, should bear some relationship to the attraction of investing or not investing." But he doesn't take into account the amount of other money. The return in % terms is lower than previously, but so is the return on all other wealth (as there is so much of it). I am not sure I agree that it means that it is a bad investment, in relative terms. However he is a far better investor than me so I will defer to him here. What do you mean the amount of other money? I don't understand. Please, explain. I just mean, as described above, that a huge amount of money (and money substitutes like bonds) have been created by the huge expansion in private sector debt over the past 70 years. Thank you. That cleared it up. Thank you for the link. I have been following Professor Keen's economics for a while. Bank money, credit money, and credit are phrases for that. I think bank money is credit money in deposit accounts banks. Those terms are used It in the document you linked.
" Saving does not by itself increase the deposits or ‘funds available’ for banks to lend.Indeed, viewing banks simply as intermediaries ignores the fact that, in reality in the modern economy, commercial banks are the creators of deposit money." Here they separate credit and money. Comment: The basis of the reasoning in the paper is accounting/ double entry bookkeeping not economics. This indicates the value of understanding double entry bookkeeping to better understanding how the economy works. "Warren Buffett's Indicator Shows the Stock Market Is Overvalued"
RE: Expansion (and contraction) in private sector debt. We should realized in addition to the usual currency dilution, that the debt could shrink with the economic cycle, a credit cycle, or a bust. With that in mind there is a need to buying low when using credit. At least a few decades ago I was in on discussions of older folks who bought real estate decades earlier than the discussion. What impressed me is how well things turned out because of the dilution of money making the real principle and interest on the mortgages decrease significantly. Their payments at some point continued lower than 1/3, 1/6 the original payments. I don't know if it was planned that way or that is just what happened. I could see how after such "success" it would be come a customary strategy passed to young. But, I think the house price to income rose too, for many. Making the buy low part difficult. I suppose with high taxes a decrease in currency stock (concentration) is quite possible with multiple surpluses. Yet, the condition of high taxes has been met for some time in many places. And, the charges for public services has been increased or added. Many things not charged for after the tax collection. So, the possibility exists. I never remembered any one saying how well they did saving bank deposits (and not converting it to some thing else.) Never. Yet some of the great speculators and investors keep cash, deposits, or bonds for future opportunities while prices are high and they have a hard time finding good deals. But, I have not been in on their discussions. Many things were previously, not charged for after the tax collection. It is true that the last 50 years have been particularly easy ones for investors. At the expense of everyone else, of course. Buffett was sited as an other point of view exists. To bad I did not find his reasoning for it. Some times he gives a clear explanation. Some times he is wrong.